A prototype of the Intelligent Drum Line system. Work-zone safety is a serious, ongoing challenge for transportation agencies. According to MnDOT, the current three-year average for Minnesota work zones is 1,819 crashes and seven fatalities per year. And that’s not counting near-misses: just talk to anyone who has worked as a flagger, and they will likely have a story about diving into a ditch to avoid being hit by a distracted driver. Consequently, MnDOT is constantly exploring ways to make work zones safer — which brings me to the photo above. What you’re looking at is no ordinary traffic cone. 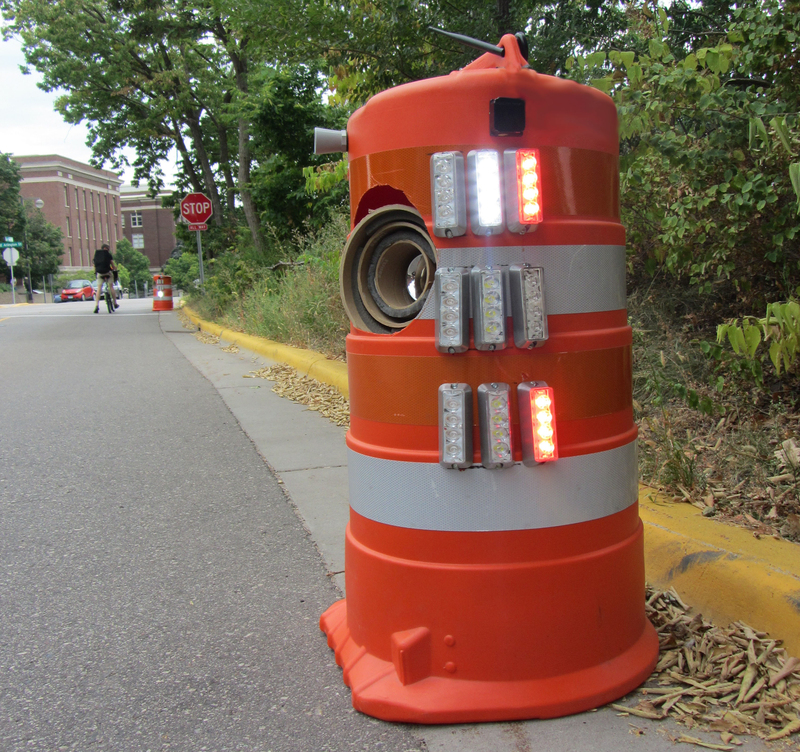 It’s a prototype of a new warning device called the Intelligent Drum Line system — basically a modified orange traffic drum packed with electronics that can detect speeding drivers and blast them with audiovisual cues to let them know they’re entering the work zone too fast. When the IDL system detects an oncoming vehicle traveling faster than a threshold speed, the system activates visual warning systems in both drums and initiates a countdown. When the speeding vehicle is approximately 1 second away from the first drum, the system activates an air horn to warn the driver. As the vehicle passes the first drum, the audible alarm terminates and the system transmits a command to the second drum to start another countdown. When the vehicle is approximately 1 second away from the second drum, the system activates another audible alarm. Testing of the IDL system at MnROAD has been successful; however, researchers still need to study how drivers react to the system in real-world conditions. Before they can do that, the design will have to be refined so that it can pass Federal Highway Administration crashworthiness tests. On a related note, MnDOT is currently funding a separate University of Minnesota study into which technologies are most effective at capturing drivers’ attention in work zones. The study will include visual and auditory cues similar to the ones used in the IDL prototype.